The Barbirolli Quartet holds an international reputation for its diverse, prolific repertoire and dynamic approach to performance. The Times has described them as "forthright, full-blooded musicians, afraid of nothing" and The Strad hailed their "superbly realised performance" and "precision of ensemble at formidable rates of energy". Following their selection by the European Concert Halls Organisation (ECHO) as the UK Concert Halls' nominated 'Rising Stars' 09-10, the Barbirolli Quartet toured the major concert halls of Europe, with performances in Birmingham, Paris, Barcelona, Luxembourg, Vienna, Salzburg, Athens, Stockholm, Cologne, Brussels, Amsterdam, Hamburg and Baden-Baden. 2010 also included a return to Amsterdam's Concertgebouw, as part of the Stichting Kamermuziek Festival, and their Kirckman Concert Society Award recital at the Wigmore Hall. 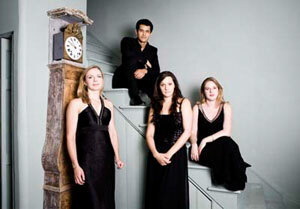 The Barbirolli Quartet has performed throughout the UK at venues such as St. David's Hall Cardiff, Bridgewater Hall, the Purcell Room and the Wigmore Hall, and has previously been selected for numerous concert schemes such as the Countess of Munster Musical Trust Recital Scheme, the Tunnell Trust Music Club Awards Scheme and the PLG Young Artists New Year Series. Following their highly successful appearance at the Cheltenham Festival in 2008, the quartet returned in 2009 with a collaborative performance alongside the Australian String Quartet which was filmed live; the DVD is commercially available through PlushMusic. They have also appeared at the Lichfield, Buxton, Ryedale and Harrogate Festivals and regularly perform at the Dartington International Summer School, where in 2010 they performed the Brahms Quintet with Stephen Kovacevich. Through the support of the Royal Over-Seas League, they performed in the 2009 Edinburgh Fringe Festival and toured Singapore, New Zealand and Australia, giving concerts and adjudicating the Pettman/ROSL Arts International Scholarship. Formed in 2003 at the Royal Northern College of Music in Manchester, the quartet has since undertaken a Chamber Music Fellowship at the Guildhall School of Music and Drama, and a Leverhulme Chamber Music Fellowship at the Royal Academy of Music in London. The quartet has also participated in courses such as the Verbier Festival Academy, IMS Prussia Cove, Britten-Pears Young Artist Programme and the ProQuartet-CEMC Professional Training Programme, and has been fortunate enough to receive tuition from numerous master musicians. The group's major influences are Eberhard Feltz, Gabor Takacs-Nagy, Erich Hobarth, Andras Schiff, Thomas Brandis, Alasdair Tait and the Belcea Quartet. Performing or teaching, the Barbirollis strive to inspire people of all ages and abilities, their students ranging from those in primary to higher education, and from amateur musicians to young professionals. They frequently give masterclasses and workshops in schools and colleges around the country and collaborate with the CAVATINA Chamber Music Trust on their workshop programme for London Schools.